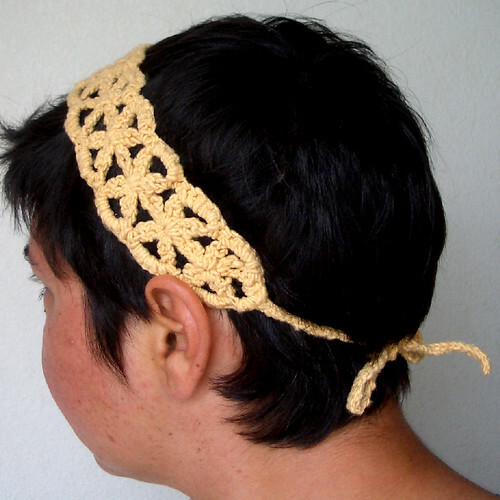 I had been working on a crochet pattern for a hat using a pinwheel motif - one that I'd made several of some years back - and then I saw two or three other very similar patterns and reorganized my priority list. This week, I had some handspun cotton left over from another project and a gift package to put together. I thought a nice summery headband would do the trick, so I went through my stitch dictionaries. This is the first version: misshawklet handspun organic cotton (turmeric), size C/2.75mm hook, sized to fit a medium (22"/56cm) head. I like the fit, although I think the ties are a little too short, and I'm not completely happy with the motif. I think the flowers look too thin and spindly. It was a little difficult to work with the hook size (the yarn is unevenly spun, mostly about sportweight), and I'd chosen the hook size in an attempt to get a certain tightness to the overall look.